Will You Be Joining Me at The Handmade Fair? My name is Becky and I am a craft addict. I can’t help myself. I am definitely a ‘dabbler’ so going to events like Kirstie Allsopp’s The Handmade Fair are right up my street. Last year I had an absolute ball and you can read all about it on my blog post. 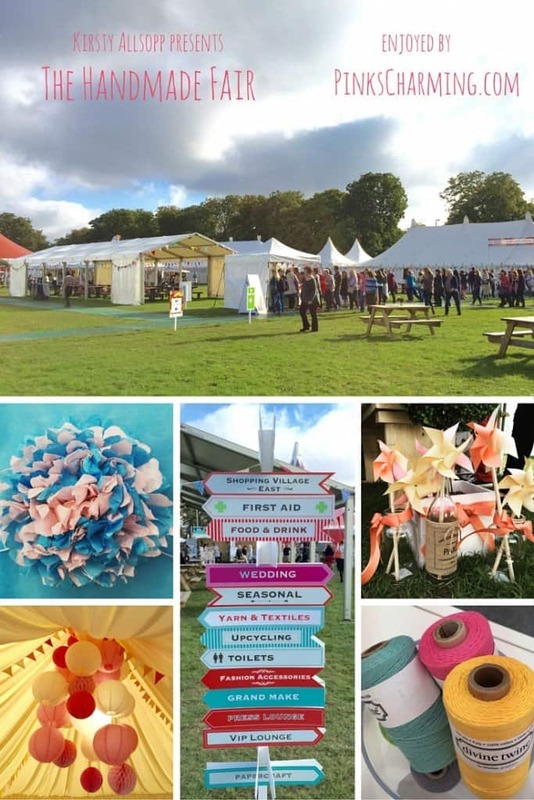 This year, The Handmade Fair takes place over the weekend of the 16th to the 18th of September, on The Green at Hampton Court Palace in London. I’m going along and hope to see you there! I have a craft cupboard full of supplies for all of the crafts I have tried over the years. Paper cutting, check. Lino printing, check. Embroidery, check. Cross stitch, check. Block printing, check. Calligraphy… I have book and pens but haven’t actually found the time to start yet. So The Handmade Fair is ideal for me, though not for my bank balance… too much temptation! Not only are there ample opportunities to stock up on craft supplies, but there are exciting new crafts just waiting to be discovered! If you follow me on Instagram or have read my blog for a while, you’ll have seen some other little bits and bobs I’ve made. Some were at The Handmade Fair, and some from the lovely kits from Mollie Makes Magazine. #Repost @kirikipress with @repostapp. ・・・ Love this Lucky Bear that @pinkscharming made for her daughter’s room! Becky left the pattern on the hoop and made a sweet little meadow with the extra floss! When you book Full Experience tickets, you also need to book which Super Theatre, Grand Make and Skills Workshop you want to go to, and there are LOADS. I found it quite overwhelming trying to decide what to go on, and sometimes your favourites clash. 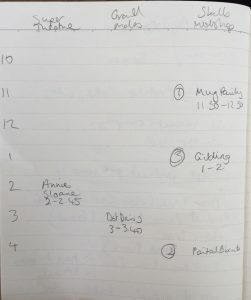 So my advice is to make a mini timetable with the times along one side, and three columns for the three events, and fill it in in pencil so you can plot out the timings. Here is mine! Luckily I didn’t have any clashes this year. If you are toying between a few favourites, you may well be able to buy a ticket to you second choice on the day, I did that last year. The Skills Workshops were my favourite as you get a whole hour to make something – bliss! And don’t forget to sort out parking before you go, unless you’re going by train, or course. So will you be going? I hope so!